Garages attached to homes often share the home’s roof. When garages are detached from the home, the roofs come in a few major types that blend well with the home and with other buildings nearby. Aside from the aesthetic consideration, choose the type of garage roof based on how you will use it and what types of vehicles you want to get inside. You know a gable roof from its distinctive triangle shape. These are very common on stand-alone garages. A gable roof is described by its pitch. If the slanted side of the roof rises 4 inches for every 1 foot it travels toward the center, then it is called a 4/12 pitch. 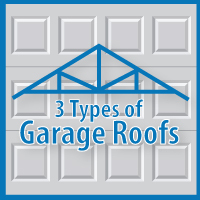 Most garage roofs use shallow pitches of 3/12 or 4/12. These shallow pitches do not give a typical garage enough room overhead for a separate story, but they do offer storage space for many types of materials. If you fold the triangular ends of a gable-roofed building toward the center of the building, you end up with a hip roof. These roofs are very popular on stand-alone garages because they diminish the roof line so it competes less with the house roof, or other roofs nearby. Typical pitches for hip roofs on garages are 3/12 through 6/12. Since you lose the gable end, the overhead storage space is cut down unless you use a 6/12 or greater pitch. Hip roofs are economical to construct because you can eliminate the gable-end wall extensions on each end of the building. Hip roofs are also more aerodynamic and are better suited to places with high winds. A gambrel roof resembles the classic barn roof with two different slopes on a side. This roof provides enough space overhead for a living area or office. Gambrel roofs also create enough space where you can get tall vehicles and boats into the garage when you set the door below the gable end. Shingles are the most common covering type for a garage roof. These asphalt-impregnated, fiberglass strips stand up to all types of weather and they are inexpensive when compared to most other roof types. When the garage stands alone, it is still a good idea to have its roof match the roof color and texture of the home. Since shingles are widely used on homes, they also find their way on to garages. Metal roofs also commonly cover garages as does rolled roofing, a very inexpensive material that goes on quickly. You can view our full garage gallery by clicking here. Or, need a new garage? Contact us today!